I don’t do pink and I’ll never own a pink jersey or I guess SHERSEY (eyeroll) or a pink Terrible Towel, and as things go, I’d pretty much like everything to be left alone. Why remake movies that were perfectly good in their time? Why do we need a billion different versions of the Operation game? Why do I have to operate on Spongebob? Why can’t CandyLand just be CandyLand? Why do I have to be racing my kid to DORA’S SUPER FUN FIESTA PARTY? Why won’t you get off of my lawn? 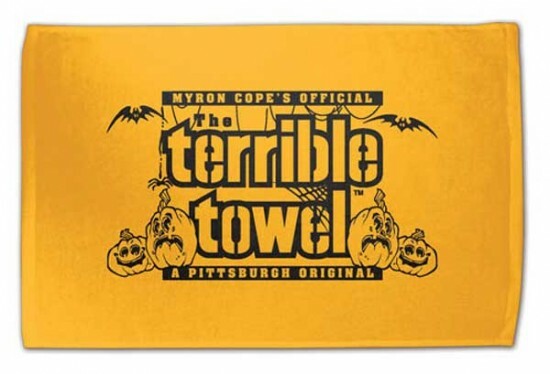 Now you would think I would raise a stink about them tweaking the Terrible Towel, but YOU WOULD BE WRONG! Two new editions of the Towel are available now. Oh, my husband is going to LOVE this. And what’s with “focus”? Shouldn’t you have him say “focme”? Unless you’re (ahem) into that kind of thing, and who am I to condemn? Wait . . . wasn’t The Thing a remake? I think Ginny wrote once that the second syllable comes out sounding a lot like “yous”. Which makes it make more sense to me. Especially if said with a do-me look on the face of either or both parties. Lowdown on The Thing. The 1982 version was a “remake” of the version from the 50’s, only with much better effects. The one that came out today is actually a “Pre-quel” and not a remake. It tells the story of how the Thing ended up frozen in the ground, to be found by the crew in the 1982 version. I absolutely loved the ’82 version… one of my favorite thrillers. When I thought the new one was going to be a remake, I wasn’t going to see it either. But now, well, I’m hitting a matinee tomorrow. And if I was of Latin descent, I would totally get the Spanish Towel. I think your husband is going to love it. 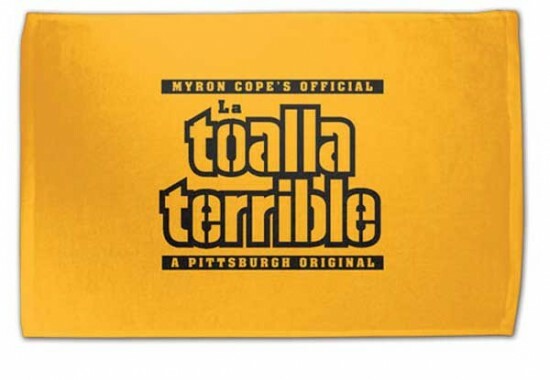 I don’t care how many terrible towel variations they make as long as the cash, or most of it, goes to the Allegheny School and not into the pockets of some shyster. The new one is a prequel, though what plot line there is left to follow I can’t fathom. It’s the identical setup to Carpenter’s film, and we know how that ended for the Norwegians: with the station burned to the ground … er, ice … and everyone dead except the two crazed people in the helicopter who chase the husky to the American station and engage in a shootout and get killed. So that’s pretty much where the prequel has to end. flame away, if you must…. but, while I am all for athletes perhaps wearing a pink ribbon or something small in support of breast cancer research, I am definitely NOT for all of the pink cleats, towels, armbands and such that they wear during the game. same for baseball players using pink bats.